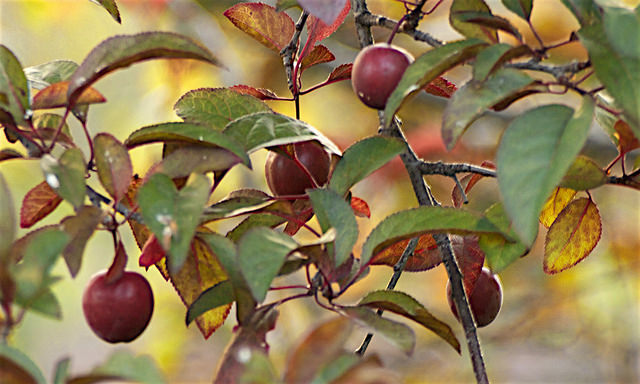 “How can I get more usable fruit from my home landscape?” When I hear this question, the problem is often that the gardener hasn’t properly pruned their fruit trees or bushes! 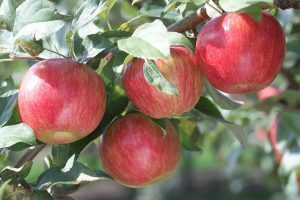 Thinning early in the season prevents overproduction, which can result in smaller fruit, and increased tree breakage, destructive insects, and disease problems. 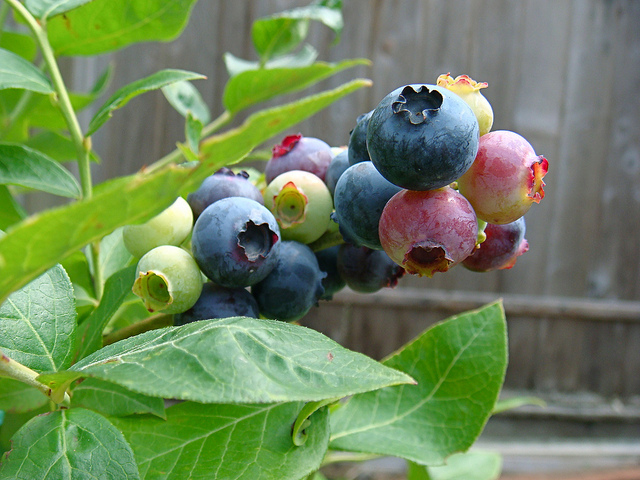 Now is the time to prune blueberries, and you can prune apple, pear, and plum trees from now through late March! NOTE: As you follow these steps do not remove more than 30 percent of the tree in one season. Regardless of what portion of the tree you prune, do not leave a stub! Remove all broken, damaged, or diseased branches—when cutting back a branch, always cut back to another branch or a bud. Prune out all suckers—suckers are branches that grow straight up. They may grow from the trunk or branches. Remove any branches that are so low that they interfere with your movement around the tree. If two branches cross and rub against one another, remove one. Thin branches on the interior of the tree. You should be able to throw a softball through the tree without it hitting a branch, limb, or fruiting spur! 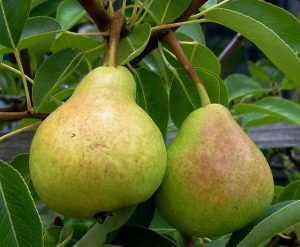 Later in the season, thin fruit when they are about the size of a nickel. Remove enough fruit so that the remaining ones are spaced about 4 to 6 inches apart along the branch. We grow two varieties of blueberries in Western North Carolina: Highbush (Vaccinium corymbosum), which grow 6 to 12 feet tall and can produce berries more than 1 inch wide and Rabbiteye (V. ashei or V. virgatum) which can grow up to 15 feet tall! Immediately after planting, always prune or rub off all flowering buds and cut height back ½ to 2/3. In late winter of the second year, remove low-lying or weak shoots and cross-overs, keeping the healthiest, large upright canes. If your plants grew vigorously, allow some flower buds to produce fruit. In late winter of the third year, prune out any weak, damaged, or diseased growth and remove 40 to 50 percent of the flower buds. Begin selecting new basal shoots that will replace older canes. “STEP ONE: Define the crown. Pruning starts at the ground, not at the top of the bush. Visualize a circle 12 to 18 inches in diameter around the crown of the bush, and remove ALL shoots of any age that have emerged from the ground outside the circle. STEP TWO: Remove low-angled canes and crossovers. Low-angled canes that are too close to the ground are undesirable because the fruit is more likely to contact the ground, or to be contaminated by rain-splashed soil. Remove these low-lying branches, and also any canes that angle through the bush (crossovers). STEP THREE: Open the center. If needed, remove one to three large canes from the center of the bush to reduce crowding, improve air circulation and phase out older canes. Old canes to target for removal are larger and grayer in color, and are more likely to be covered with a fuzzy growth of foliose lichens. It may be hard to prune out so many blooms, but you’ll soon see the results are worth it! Craving homegrown veggies, but not much space, poor growing conditions, contaminated soils, or past failures with container gardening? Consider EarthBoxes®, a growing method developed by Florida farmer Blake Whisenant, working with university researchers and Cooperative Extension. Whisenant, using C. M. Geraldson’s gradient-oriented nutritional paradigm, created EarthBox® as a self-contained system with growing medium, fertilizer, lime, a water reservoir, and plastic mulch cover. Although Extension Master Gardeners don’t endorse commercial products, EarthBoxes® resulted from research to develop a growing system that manages water and nutrients for optimal plant growth. Having grown vegetables at homes in different states, as well as a local community garden, I know that EarthBoxes® produce better yields in less space than conventional in-ground planting—with minimal maintenance! Mixed with the recommended amount of dolomitic lime. Covered with a plastic mulch “cap” that is either black, white, or red. You need not buy soil mixes, fertilizers, and lime sold with EarthBoxes®—it is often cheaper to purchase these in bulk. Choose either conventional or organic products—just do NOT use garden soil and DO use dolomitic lime rather than other lime formulations. Carefully follow your EarthBox® instructions for the amount and placement of these ingredients—you should NOT add any more fertilizer during the growing season! The boxes will last indefinitely—I have one that is almost 20 years old and left outside most of that time! 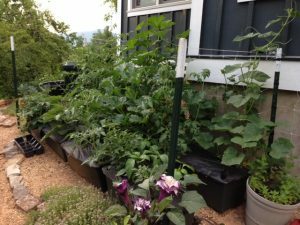 The growing medium can be reused for many years—with just some topping up when you replant your boxes the next growing season. Replenish fertilizer, lime, and mulch covers every year. Include frost covers to extend the growing season. You must keep the EarthBox® water reservoir partially full, so your plants’ dense root systems are evenly moist. This enclosed system means you cannot rely on rainwater, so boxes without an automatic watering system might require water twice a day by midsummer! The upside is that during wet seasons your boxes will not become waterlogged and/or leach nutrients—one reason Whisenant designed EarthBoxes® was crop loss from flooding in Florida tomato fields! Adding an automatic watering system makes your boxes almost maintenance-free. The system sold to accompany EarthBoxes® can be a bit difficult to set up (their instructional video provides pointers) and may be vulnerable to coming apart and leaking. To minimize the toll of accidental leaks, I use a timer to limit how long water flows to the boxes; 15 to 20 minutes every 6 hours keeps the reservoirs filled on my eight-box system. Use a “Y” connector when you hook up your automatic watering system to allow using your hose bib for other watering chores. Make sure you keep any hose bib shut-off valve to the EarthBoxes® open at all times! Turn on the faucet far enough to create sufficient water pressure to keep your boxes watered. What can you grow in your EarthBoxes®? Just about any vegetable—and many fruits and herbs—grown in our area will grow in an EarthBox®. I do not grow perennials (asparagus, rhubarb, strawberries, and many herbs) in EarthBoxes® because you must disconnect the watering system before frost! A single box will hold 2 full-size tomato plants, OR 2 eggplants, OR 4 cucumber vines, OR 6 pepper plants, OR 8 lettuces, OR 16 bean plants. This may not seem like much, but I harvested 119 full-sized fruits from the two ‘Better Boy’ tomato plants I grew in my first EarthBox®! Although EarthBox® provides planting placement instructions for many other crops, I have found it difficult to start seeds in the boxes—use your own or purchased transplants—so I do not grow beets, corn, or radishes in these systems. Trying new crops is part of the gardening adventure, though—experiment to find the best choices for your EarthBox® space! Not every crop will do well every year but pay attention to timely harvesting and any disease or insect problems and you’ll typically see greater yields than from the same plants grown in the ground—and in a smaller space! 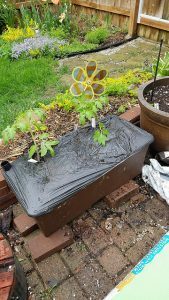 The downside is the initial investment, so starting with a single EarthBox® or two with a watering system is a cautious approach. There are also many “do-it-yourself” versions of the boxes, and variants on irrigation methods, but I can’t vouch that you’ll get the same results with these substitutes. If you do try EarthBoxes®, remember that you can consult with those of us who have used them before. Our Extension Master Gardner helpline opens again in March, along with info tables at many gardening events in our area! Article by Debbie Green, Buncombe County Extension Master GardenerSM Volunteer. “I sure am glad that is over!” I’d say about vegetable gardening at this time of year. After dealing with diseases, insects, too much water, too little water, and lots of weeds, I was happy to remove any remaining vegetables, take soil samples for testing, sow a cover crop, and put my garden to bed. Now I am pleased to pick and eat fresh greens from the garden into winter when temperatures drop below freezing! In the colder months in USDA plant hardiness Zones 6 and 7, you can grow arugula, collards, green onions, kale, leaf lettuce, mustard greens, pak choi, radishes, and spinach. The trick to extending the growing season is to protect your plants from cold. We’ll review two frost protection methods. 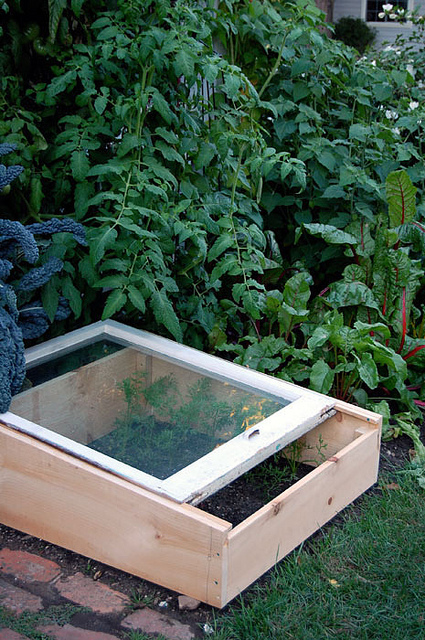 A cold frame is a box with a clear plastic or glass lid that acts as a miniature greenhouse. The use of a well-constructed cold frame can extend the growing season through the fall and into the winter. It is generally used away from the garden as it tends to be permanent once finished. Uses. A cold frame is very versatile and can be used for hardening off plants, starting plants from seed, and for growing the cold tolerant plants. Construction. 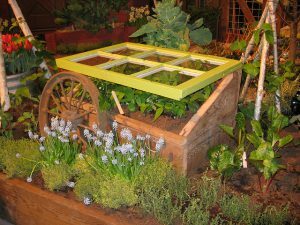 Building a cold frame does not require an extensive knowledge of construction and is a fun activity for the whole family to participate in. The good thing about building one is that once you have accomplished it, with just a little yearly maintenance you don’t have to do it again. Most cold frames are constructed of wood and the top can be a repurposed window that has been removed from a house. Cautions. Be sure to always have a way to open the cold frame’s top and keep it open, as temperatures inside the cold frame even during the winter can increase to the point where they will harm the plants. 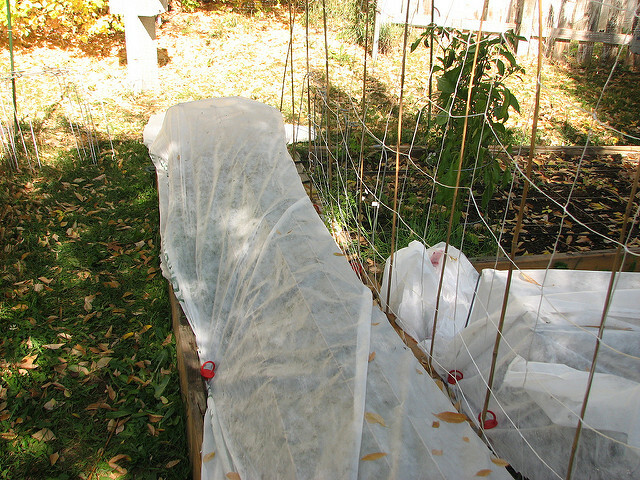 Use temporary row covers directly in the garden to extend the growing season. Following installation, most row cover arrangements resemble long tunnels covering the plants. They require regular maintenance and attention in order to perform properly. Structures for supporting the covers. Construct these from a variety of materials, including ½ inch PVC water pipe, metal fence posts, or repurposed wood. They must have some mechanism for opening, both as a means to facilitate harvesting the plants and to allow for air circulation in response to rising internal temperatures. Cover materials. “Remay” or “Agribon” are examples of the material used to cover these structures These fabrics weigh 1.5 to 2.2 ounces per square yard, are designed to provide 70% light penetration, protect down to temperatures of 28 degrees (F), and allow rain and overhead irrigation to pass through. NOTE: These materials differ from floating row covers used to protect against insect infestations, which are lighter in weight (around 0.5 oz. per square yard), allow up to 95% light penetration, and do NOT provide protection below freezing. No matter how you choose to extend your gardening season, I believe you will find it rewarding, educational, and a way to keep that good feeling that comes from getting your hands dirty well into the fall and winter. Article written by Bob Wardwell, Extension Master GardenerSM Volunteer.